The Department of History is proud to host the annual Melville-Nelles-Hoffmann Lecture in Environmental History on March 20, at 4pm, in the Schulich Private Dining Room. 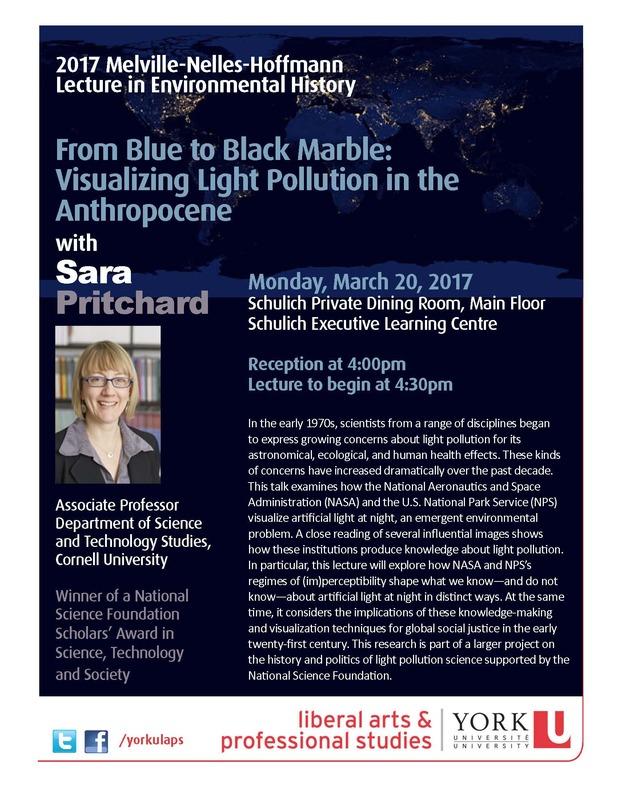 This year’s lecture will be delivered by Professor Sara B. Pritchard from Cornell University. Professor Pritchard is a leading scholar in environmental history and Science and Technology Studies whose new research examines the politics of light pollution and light-pollution science. She is the recipient of a National Science Foundation Scholars’ Award in Science, Technology, and Society. Professor Pritchard’s lecture will examine the growing concerns of scientists in the early 1970s about light pollution for its astronomical, ecological, and human health effects. These kinds of concerns have increased dramatically over the past decade. This talk will examine how the National Aeronautics and Space Administration (NASA) and the U.S. National Park Service (NPS) visualize artificial light at night, an emergent environmental problem. A close reading of several influential images shows how these institutions produce knowledge about light pollution. In particular, this lecture will explore how NASA and NPS’s regimes of (im)perceptibility shape what we know—and do not know—about artificial light at night in distinct ways. At the same time, it considers the implications of these knowledge-making and visualization techniques for global social justice in the early twenty-first century.